Between 1953 and 1955 ENEL built, for the production of electricity, a dam on the Tiber River just downstream of the confluence with the river Farfa. Following the realization of this dam, immediately upstream of the latter, he is lifted up the water level, with the consequent flooding of surrounding lands. It formed thus a kind of “lake”, extended for about 300 hectares, able to accommodate a large number of species of birds during their migration. The ecological importance of Lake Nazzano then led in 1968 to the creation of a wildlife protection oasis thanks to the agreement established between ENEL, the City of Nazzano and Italy WWF. As a result of this protection, the birds still increased to an extent that the area deserves to be inserted in 1977, by decree of the Ministry of Agriculture and Forests, the list of wetlands of international importance protected by the Ramsar Convention. In 1979, in the old oasis and some adjacent areas (occupied by forests and farmland or pasture), the Lazio Region – with the law 4 April 1979 n. 21 – established the “Nature Reserve Tevere-Farfa”, first regional protected area includes part of the territories of the municipalities of Nazzano and Torrita Tiberina. Today the reserve, which became “area of regional interest” as governed by the law of the Lazio Region no. 27 of 1999, also includes part of the municipality of Montopoli di Sabina. 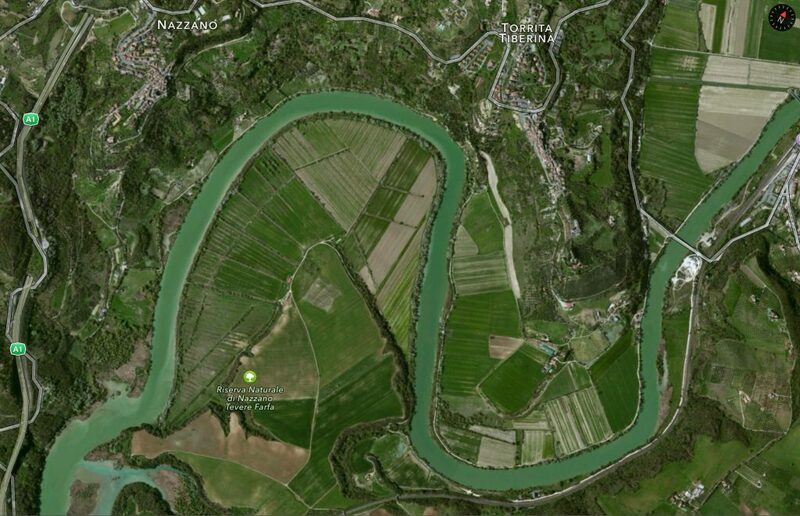 The Reserve landscape is characterized by the morphology of the Tiber which in this section passes slowly forming large bends and meanders. The river valley, typically alluvial deposits of clay, sand and gravel, is bordered by modest-sized hills made up of marine sediments. The rich presence of birds into the lake is one of the great attractions for visitors. In addition to waterfowl such as mallards, teal, widgeon and tufted duck, it is possible to observe the great crested grebe, coot, kingfishers and raptors such as the marsh harrier and osprey. The reeds, mainly consisting of straw and cattail, is sometimes embellished by the yellow blooming iris marsh while on clay soils, we find the burdock and horsetail among the roots of red and white willows. This is the realm of many birds like the warbler, reed warbler, the water rail, moorhen and the otter, mammal of American origin allochthonous naturalizzatosi for decades in many Italian wetlands. Where the reed bed thins out, in areas with standing water, you can observe the potamogeto, the American azolla and curious duckweed from tiny rounded leaves. This habitat is very important for the reproduction of fish, insects and amphibians such as the newt and the green frog. The cultivated areas and pastures of the wide plain of Nazzano are mostly frequented by crows, but they are also the places where it is easier to see the lark, rate and reptiles such as the rat snake. On the banks of the river, especially on the right bank, it is one of the few surviving examples of riparian forest of the entire lower course of the Tiber formed by whites and blacks poplars, laurels, alders and some oak. The tops of these trees are a great retreat for the egret, great white egrets and herons whose nesting has been documented. On hillsides that overlook the Tiber valley we can see the dark foliage of oak, especially where the slope is steeper, but also of leafy deciduous oaks such as oak and turkey oak. Contribute to form this forest of high conservation interest the Judas tree, recognizable by bright purple blooms spring, the flowering ash, hornbeam, field maple as well as the shrub species such as mastic, viburnum and phillyrea from small fragrant white flowers. In this compound wooded setting it has been documented porcupine, marten, the wild cat and numerous small rodents, preferred prey of the barn owl and other owls.